Open plan living room, kitchen and dining area, a double bedroom with en suite, a twin bedroom, and a shared bathroom. Large mezzanine with twin beds. Private swimming pool, sun terrace with pergolas. 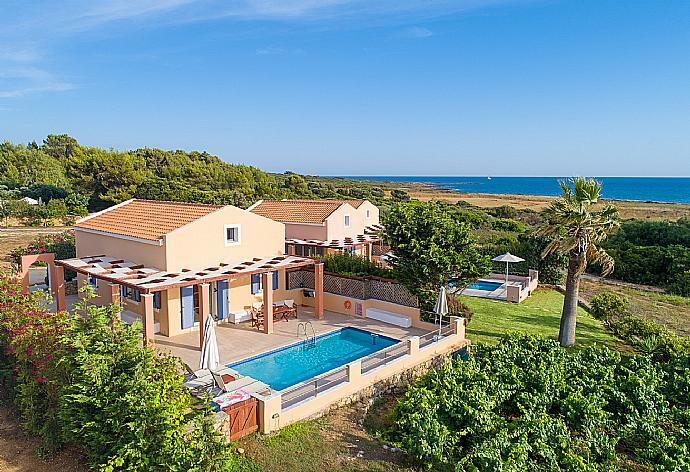 A really nice family holiday in a perfect setting, with a lovely villa and nearby restaurants. What an amazing holiday location! Greece always delivers. 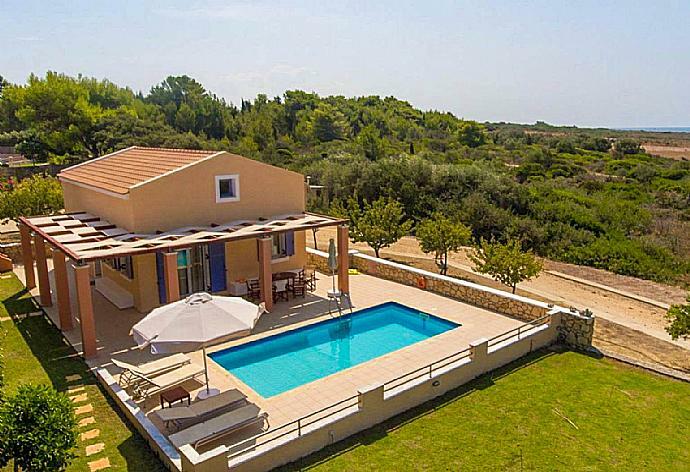 A beautiful villa in a stunning unspoilt location. What a happy and relaxing two weeks. Maria and her team were fantastic as always. It is a fabulous spot and the new swimming pool and bar are a great addition. They have recruited new staff well and the standard of food seems to have got even better if that is possible. We aim to return next year if we can. Fabulous location, traditional Greece at its best! We loved having a drink watching the sunset across the bay. Local tavernas were fabulous too. We will definately return. Lovely place to stay peaceful with beautiful sunsets would definitely recommend it also Agni Travel were brilliant dealing with questions and requests. The property was first class with beautiful views and is very comfortably furnished. Staff at Remetso are very helpful and the food at the taverna was excellent. 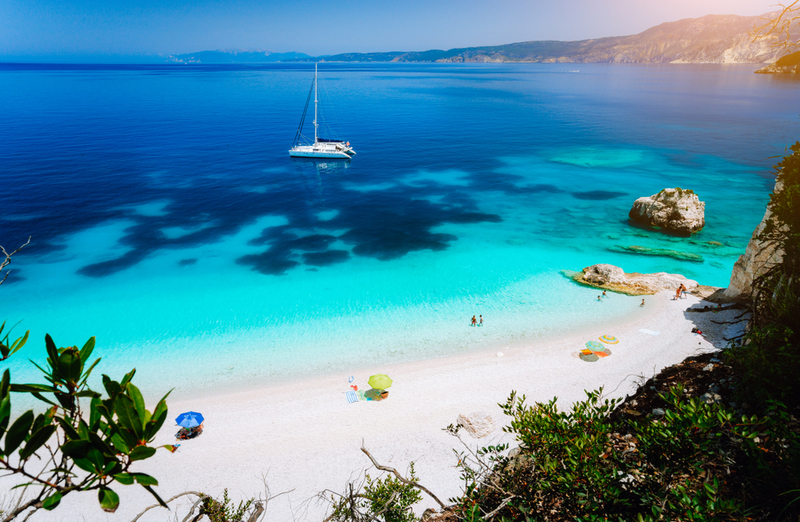 Kefalonia is a lovely island and we are planning a return trip all being well will be in touch with the Agni Team again to enquire about availability. We had a great time! Great accommodation and good food at the local tavernas. A very pretty part of the island. Super place and a very enjoyable time! Overall we thoroughly enjoyed our stay at antigoni beach house. The attention to cleanliness regarding the pool and house-keeping was great. The location was beautiful with the unspoilt beach down the path. The air conditioning was efficient and we also appreciated the insect blinds on the bedroom windows. A splendid holiday for anyone who wants to be away from it all. Car hire is a must to appreciate the beauty of the island. The ferry across to Argostoli was cheap spot on time and very convenient.The taverna supplied food of excellent quality but a daily special or two would have been a bonus. We liked the other tavernas in the area especially the one on the nearby beach. Really good, helpful staff, villa beautiful. The house was clean, the people, the weather, the surroundings the island etc. etc. and the care of the Agni Travel team were all awesome. We had an unforgettable holiday and will certainly come back to Kefalonia sometime or to the Agni Travel team for another holiday. We had a fantastic time. On arrival it was raining and we had thunderstorms which resulted in us having no power. This was soon resolved and the power was back on. We had someone stay in touch with us to make sure we were ok. Very pleased with everything. Thank you for a wonderful memorable holiday. Absolutely superb. The property was extremely comfortable and well equipped. The position and views could not been surpassed. The local tavernas, we ate at three, within very easy walking distance were excellent. Everyone we dealt with from booking to owners maintenance, staff tavern staff etc were helpful and knowledgeable.All in all a fantastic time and will certainly re-book ourselves and recommend.Thank you. The Antigoni beach house was perfect and fulfilled everything we were looking for in our holiday. Remetzo taverna offer an excellent menu and even provided us with two off the menu meals which were amazing. (Sword fish souvlaki and fresh fish Greek style.) The staff were very friendly, very welcoming and nothing was a problem. We will be returning. This was our second time at this villa. We love it. Just perfect for us. Close to an unspoiled beautiful beach. Close to taverna and beach bar. Can also wade/swim round to next bay where there is another taverna to have more choice. We loved having a swim before breakfast when we had the beach to ourselves. We went into Lixouri every day and sat in the beautiful square and had coffee. Perfect holiday for us. We will be back. The villa is nicer than the brochure. The holiday was excellent and relaxing and I wouldn't hesitate to visit again. We all enjoyed it enormously. It was a perfect holiday. Already dreaming of going back. Car hire effortless. driving instructions very helpful. no trouble finding our way from airport to ferry to Lixouri and on to villa. Villa Near enough to Lixouri to nip in for a coffee or beer in the tree lined square overlooking the water.Property perfect. Excelled expectations. Fabulous situation. So near to the beach Taverna and beach bar. Beach great. High quality fixtures and fittings. Very comfortable. Towels changed and cleaning every day Owner staff and locals all very friendly. Fantastic holiday, will be back. Vrahinari is a secluded beach with just 2 tavernas and a few rental properties. You can enjoy traditional meals and welcome at the 'Remetzo taverna'; just a few steps from the villa. 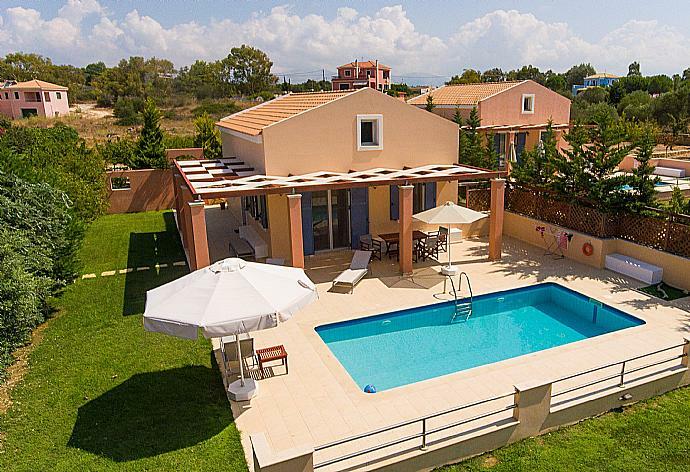 The taverna also features a separate, newly added, swimming pool which can be used by clients of the villa and taverna. The nearest village for mini-market and fresh produce being Manzavinata which is a short drive away. The large town and port of Lixouri, where you will find shops and more tavernas, is around a 5 min drive.